Hat-tip once again to Kottke’s Quick Links for directing our attention to Crazy Walls, a blog obsessed with the appearance of forensics walls in film and television that attempt to connect and solve mysteries by linking maps and newspaper clippings through red yarn. Following the principle of conservation of detail, the method called concept mapping can be used to filter out red herrings when the investigator does not know what easily overlooked detail might lead to a break-through and looking for relevance in every detail can drive one to distraction or worse. 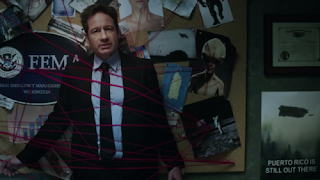 Though sometimes in earnest or sometimes meta-critical like this cameo of X-Files’ David Duchovny (previously) on Full-Frontal with Samantha Bee—bringing us back around to the matter of Puerto Rico whose underreported casualties might have been shoved out of the news cycle in part by amplifying and hijacking the host’s own monologue, most often the trope is used to lampoon conspiracy theorists.